Lester Jones, Photographer May 26, 1940. Springfield, a two and one-half story brick house just east of Louisville, Kentucky, was the boyhood home of Zachary Taylor, 12th president of the United States. As a career military officer for most of his life, he moved often, and the 20 years he lived at Springfield was the longest period he ever stayed in one place. 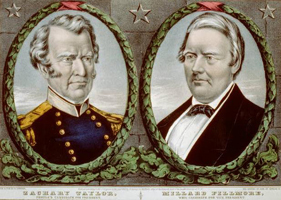 A hero of the Mexican War, Taylor was the first professional military man elected president and the first not previously elected to any office. A strong nationalist, in spite of being a slave holder himself, he opposed the extension of slavery into the territories newly acquired from Mexico and threatened to use military force against secessionists to preserve the Union. He died suddenly in July 1850 cutting short his controversial term in office. Born in Virginia in 1784, Zachary Taylor was just a baby when his family moved to a 400-acre farm on Muddy Fork of Beargrass Creek just east of the village of Louisville, Kentucky. His planter father built the earliest part of the two and one-half story brick house, named Springfield, c. 1790. Richard Taylor prospered, and by the 1830s increased his farm to 700 acres and doubled the size of the house. Zachary Taylor received an elementary education from tutors. At Springfield, he learned to ride, shoot, and hunt-practical skills that would later prove useful in his military career. As a teenager, he joined the Kentucky militia, and in 1808 entered the United States Army. Two years later on leave, he returned to Springfield to marry Margaret Mackall Smith. Five of their six children were born at his childhood home. Taylor probably returned periodically to visit his father, who continued to live at Springfield until his death in 1829, when the family sold the plantation. In 1845, under President Polk’s directives, Taylor defended Texas prior to and during the war with Mexico, winning victories at Palo Alto, Resaca de la Palma, and Monterrey. President Polk was unhappy with Taylor’s independence and well aware of his growing popularity with the public and his potential as a presidential candidate. Polk ordered Taylor to remain in northern Mexico and sent General Winfield Scott to capture Mexico City. In 1847, Taylor triumphed again at Buena Vista, even after Polk stripped him of most of his Regulars. Near the end of the year, with the escalating tension between the two men, Taylor retired from the military. "Zachary Taylor, people's candidate for President"
Taylor’s standing as a military hero and his reputation as a political non-partisan convinced the Whigs that he would make an excellent presidential candidate, appealing to both Northern and Southern sentiments. He asserted that he would be a national rather than a partisan president and that principle would prevail over party and politics. Ever independent, upon winning the 1848 election, Taylor promptly began pursuing his own ideals. Although a slaveholder himself, Taylor rejected a congressional compromise on the extension of slavery into the territories taken from Mexico. His most serious problems were California and New Mexico. In 1848, the California gold rush began, increasing the urgency to establish government in the west. In order to avoid bitter debates over the status of slavery in Federal territories, Taylor encouraged California and New Mexico to bypass territorial status and enter the Union as states as soon as possible. He sent word to residents of the two areas that they should decide the slavery issue for themselves. When southerners objected to admission of California as a free state, Taylor threatened to use military force if necessary to uphold the law and the union. Taylor fell ill in 1850 after attending a July 4 celebration at the Washington Monument and died five days later. He and his wife lie buried in the family burial grounds at Springfield, now part of the Zachary Taylor National Cemetery. The Zachary Taylor house is a two and one-half story brick building. The slightly projecting original section dating from around 1790 consisted of two rooms on the first and second floors. Some time, probably between 1810 and 1829, an extension to the east of the house added two more rooms on each floor and a broad central stair hall. A two story wooden porch it attached to the rear of the house. In 1974, a tornado caused severe damage to the now restored house. Originally located on a 1,000-acre plantation, the Taylor house now has substantial houses on large lots surrounding it. The Zachary Taylor Home, Springfield, is a private home, not open to the public, located in Louisville, KY. Springfield has been designated a National Historic Landmark. Click here for the National Historic Landmark registration file: text and photos. 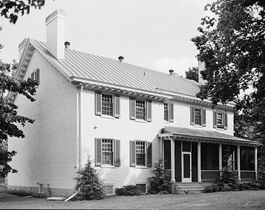 The house has been documented by the National Park Service's Historic American Buildings Survey. The family burial ground where Taylor and his wife are buried was originally part of Springfield plantation. The plantation was subdivided in the 20th century, and the half-acre burial ground, which includes a tomb and mausoleum, is now part of the Zachary Taylor National Cemetery at 4701 Brownsboro Road, Louisville, KY, about half a mile away from the house. The State of Kentucky erected a 50-foot granite monument near the Taylor burial site in 1883, and the U.S. government added a memorial building in 1926. The cemetery is open for visitation from sunrise to sunset year round. For further information call 502-893-3852 or visit the Zachary Taylor National Cemetery website.